We take a look back at the weekends sunny football fixtures, which have brought along a great number of very decent boot spots. We finally got to see the Adidas F50 Adizero Messi edition, however, not on the feet of Lionel himself; we spotted a deadly Dane, a couple of blackouts, as well as a plenty of other goodie goodies. Jarosiv Plasil (Bordeaux)  Nike Mercurial Vapor VIII ACC CR7 To kick things off we spotted one of the favourites, which really only was intended for the Mercurial main-man, Cristiano Ronaldo, but the awesome design looks to have gotten a couple of professionals to invest in a pair too. Among them is Jarosiv Plasil, who applies his trade in the French Ligue 1. 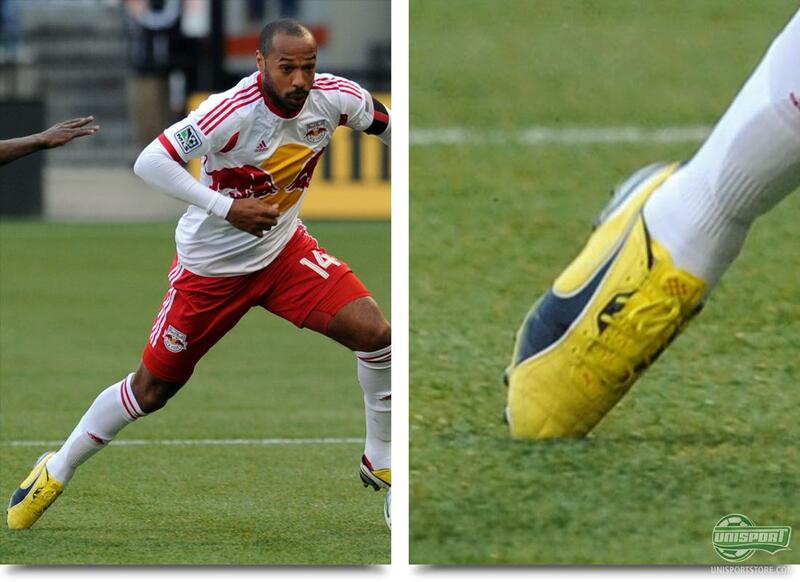 Thierry Henry (NY Red Bulls)  Puma King Yellow/Black The French legend is still going strong in the American league and here he has really looked comfortable in a pair of Puma King Yellow/Black. We had expected that he would be using the SL-model like he did with the last generation, but it must be the leather that attracts the former Arsenal player. It is also worthy of mention that he hasn't changed to the newest colourway yet. Jalil Anibaba (Chicago Fire)  Nike Tiempo Legend IV ACC White/Black/Total Crimson The alternative colourway of the Legend IV has not received the same amount of support, as the Black/Electric Green has. Until now, we have only seen Manchester Uniteds Chicharito in the boot, but now he looks to have gotten a boot-buddie across the pond. 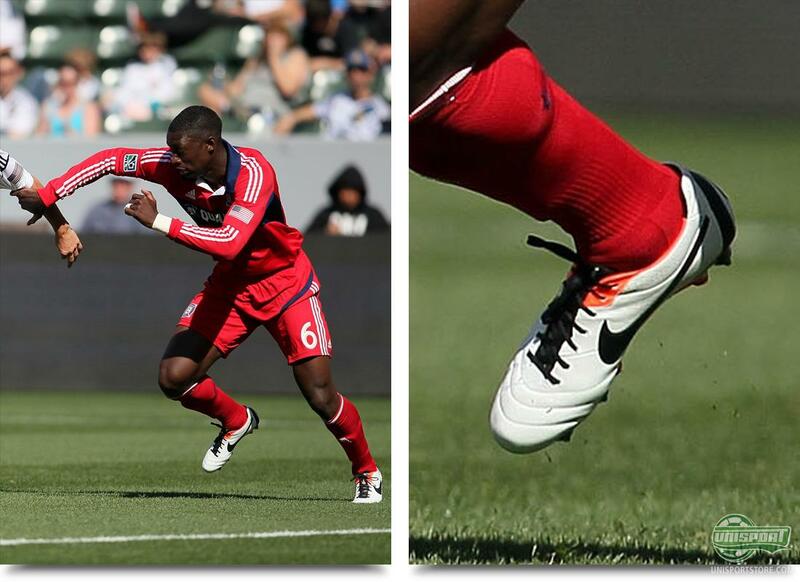 Jalil Anibaba showed off his pair while playing for the Chicago Fire and we have to say, it really looks classy on the pitch. Adam Taggart (Melbourne Hearts)  Adidas Adipure 11Pro SL Black/Red One of the rare spots we have to travel all the way to Australia to find. The Australian league has pulled in some big names lately, with Del Piero and Emile Heskey have made to the move down under. It was however none of the two, who stole the show this time round. 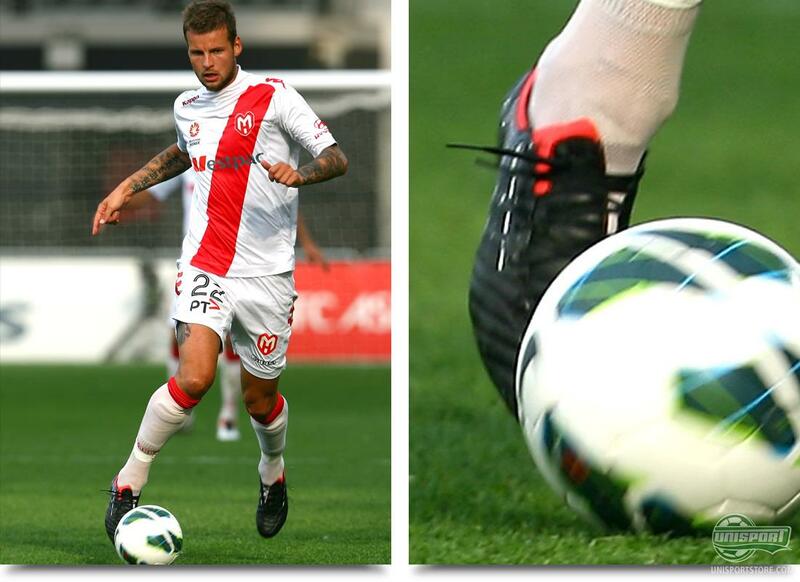 It was instead Adam Taggart, who had jumped in the 180 gram Adidas Adipure 11Pro SL Black/Red. Nick Kalmer (Newcastle Jets)  Nike Timepo Legend IV ACC White/Black/Total Crimson Things are really picking up for the Nike Timepo Legend IV ACC White/Black/Total Crimson, which in the last week has tripled its following. Once again we find it in Australia, where Nick Kalmer did his bit to improve the reputation of the colourway and once again we just have to applaud Nike; that design is delicious! 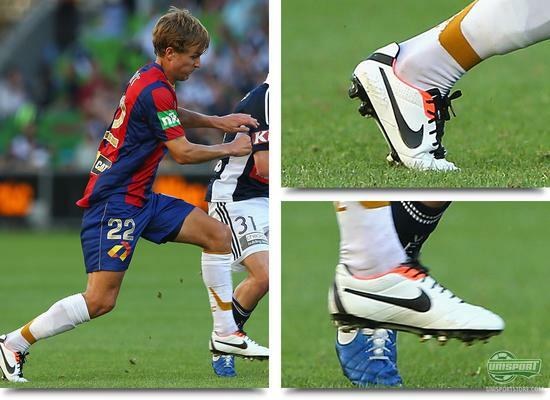 Eli Babalji (Melbourne Hearts)  Nike Mercurial Vapor IX ACC Metallic Platinum/Electric Green/Black It turned out to be a very good idea to go for a look through the Australian games, where we spotted amazing boots left, right and centre. It was Eli Babalji who sported the Metallic Platinum/Electric Green/Black colourway, which believe it or not, is the more subdued version of the Nike Mercurial Vapor IX. In essence it's just a Vapor VIII in disguise, but it still looks nice. Connor Sammon (Derby)  Adidas F50 Adizero Messi Red/White Yes! 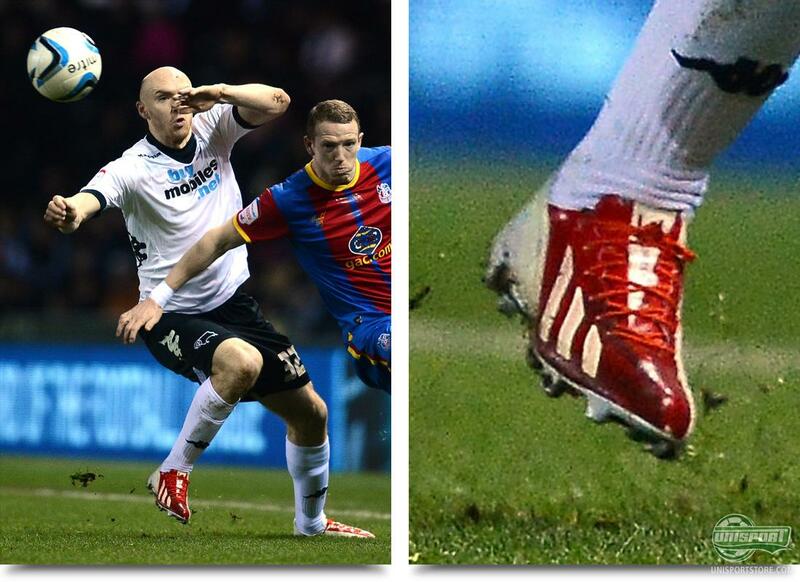 Finally a début for the new Messi boot... At the feet of Connor Sammon from Derby. 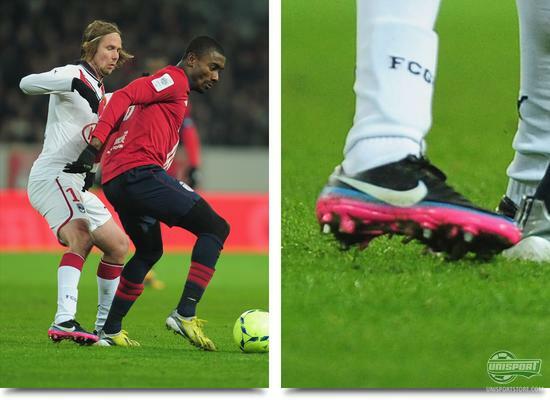 It is a bit comical, that the only players to début the supposedly exclusive Messi boot, are relatively unknown players from lower league clubs. Lionel Messi owes us a début and when considering they look this good, you can't think it will take too long. 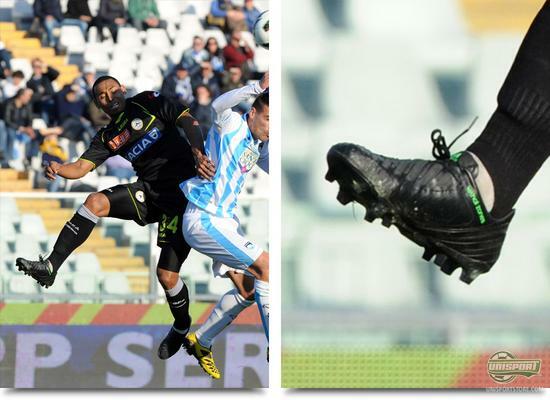 Maicosuel (Udinese)  Adidas Predator LZ Blackout We spotted a pair of our favourites in the Serie A, where a pair of completely black Adidas Predator LZ found their way to the feet of Udineses Maicosuel. He has not been tempted by some of the more daring colourways and has instead kept things simple, with a boot that is completely blackouted bar the subtle green detailing. Giuseppe Sculli (Pescara)  Adidas Predator LZ Blackout In exactly the same header we spotted yet another pair of blackouted Adidas Predator LZ. They do however differ from Maicosuels, as these are the prototype-boots. This is revealed by the colours, or rather the detailing, which is the orange  identical with the prototype-boots, Adidas gave Jakob when he had to test the Predator back in the day. Robert Braber (RKC Waalwijk)  Adidas F50 Adizero Prime Orange/Black One of the most legendary lightweight boots ever still shows up from time to time in the world of football. 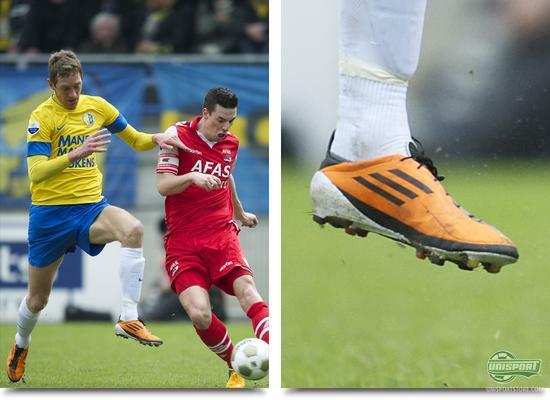 A pair of Adidas F50 Adizero Prime in the original launch colour, caught our eye in the Dutch Eredivisie. A just 145 gram boot, which still brings fond memories for many of us Boot nerds. 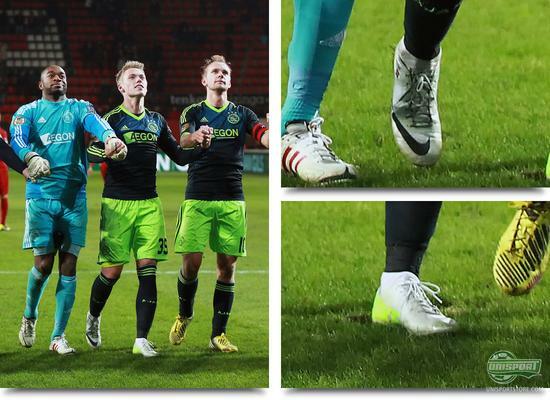 Viktor Fischer (Ajax)  Nike Mercurial Vapor IX ACC Metallic Platinum/Black/Electric Green The deadly Danish super talent continues to impress in Holland and now he has found his way to our boot spots, when he surprisingly found a new pair of boots. The choice was a pair of Vapor IX Metallic Platinum/Black/Electric Green with personal embroidering and we definitely think it suits the future star well to be wearing the alternative boot. 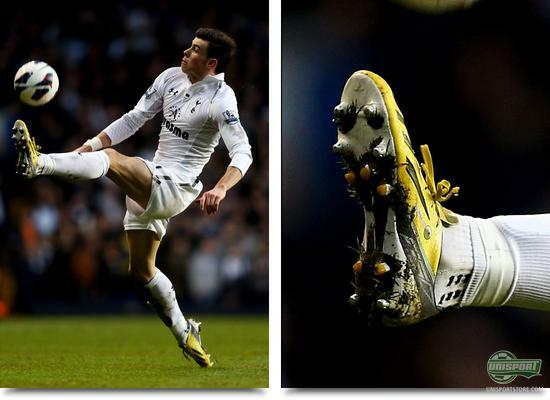 Gareth Bale (Tottenham)  Adidas F50 Adizero Yellow/Black The Welshman is flying at the moment and his boots might be the secret weapon. He prefers the Adidas F50 Adizero in microfibre and furthermore has them made without miCoach cavity. He combines the boots with a pair of Trusox, to get the very most out of his energy and at the moment all you can say is, that it seems to be working. 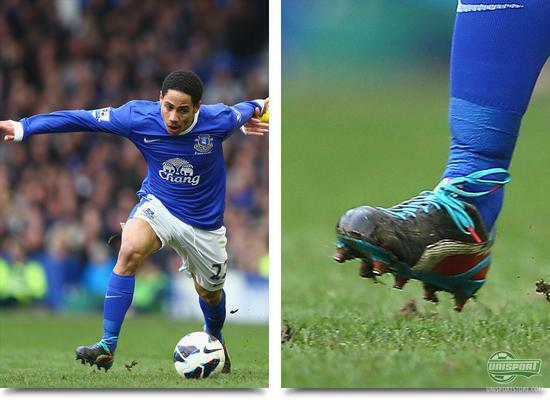 Steven Pienaar (Everton)  Puma EvoSpeed 1 Red/White/Blue Blackout The South African attacking profile has apparently been working hard to make his Puma EvoSpeed 1 a little more personal. He has in any case blackouted the entire front-foot, but why exactly is a mystery. We have a sneaky feeling that it is because red boots are banned in Everton, as they are not allowed to match the local rivals from the red half of Merseyside. 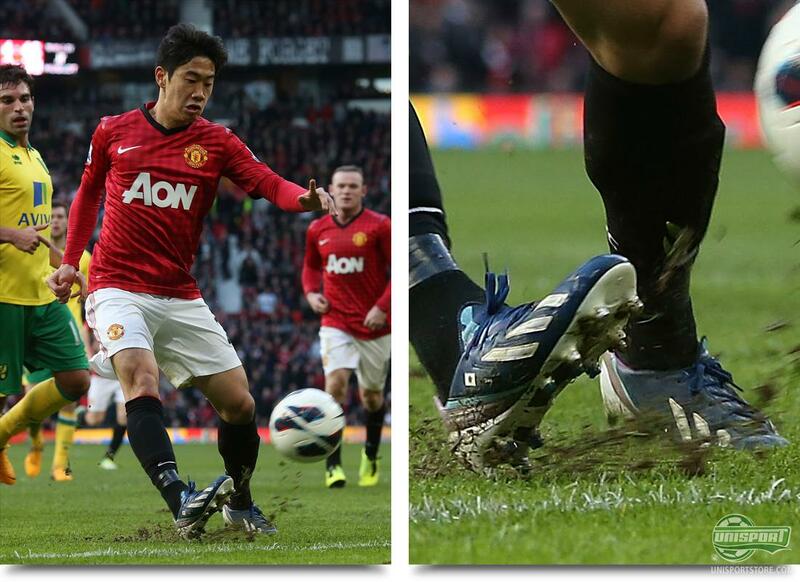 Shinji Kagawa (Manchester United)  Adidas F50 Adizero Blue/White/Purple We round off this weeks boot spots with the Japanese star, who fired his way into contention at Old Trafford, when he elegantly brushed aside Norwich with a hattrick. He did so in a pair of Adidas F50 Adizero Blue/White/Purple, but remarkably he wore a pair without the miCoach cavity. The construction looks quite special and definitely not like the regular Sprintframe, just like Bale and Menez. We stretched far and wide in this round of boot spots and when we look back, we spotted quite a collection. Do you have a favourite spot among them? Have you seen anything we didn't? Tell us in the box down below.